San Marcos Academy is a coeducational, Christian boarding and day school for 7th through 12th grade students, located in the beautiful Texas hill country. We have enjoyed serving the students of Aramco families for several decades. SMA offer a unique educational experience that provides for the intellectual, social, physical and spiritual development of each student. The Academy is steeped in tradition, is fully accredited, and offers a rolling enrollment. Our current enrollment of 274 students includes 154 boarding students who represent 13 different countries. Our Christ-centered foundation provides a safe environment for students to grow in their faith while experiencing a diversity of ideas and cultures. The faculty and staff at San Marcos Academy are committed to serving students and setting them on the path to a bright future in which they can make valuable contributions to the world as a whole. We add value to every subject and activity because of our common purpose and mission: educating young men and women within a nurturing community based upon Christian values." SMA is a member of the Association of Boarding Schools and is a partner school with the Independent Educational Consultants Association. We are also a member of the Texas Christian Athletic League and the Christian Athletic League of San Antonio. We are affiliated with Texas Baptists through the Baptist General Convention of Texas. 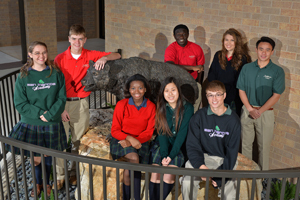 SMA was named one of the 30 Best Christian Boarding Schools in America by www.TheBestSchools.org. Honors students are challenged with the opportunity to take dual-credit college courses (in a partnership with Hardin-Simmons University), as well as pre-AP/AP and honors courses. Those students with learning differences (ADD, ADHD, dyslexia, etc.) may qualify for placement in the Learning Skills Program, which offers one-on-one or group tutoring, re-teaching of subject material, verbalized testing, project assistance, and organizational skills instruction. Opportunities for credit recovery are available through our blended classroom environment and through San Marcos Online Academy. All boarding students benefit from attending evening study halls in the dormitory or a more intensive Structured Study Hall, where tutoring and close supervision is provided by degreed instructors. Progress reports or report cards are mailed out every 3 weeks to keep parents updated on their student's progress. Each year 95 percent or more of our graduates attend college following graduation. 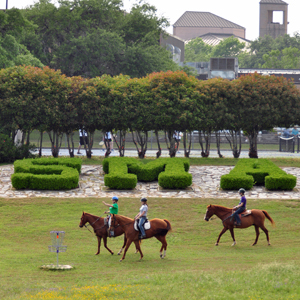 Situated on 220 acres of former hill country ranch land, the San Marcos Academy campus provides a comfortable, laid-back and relaxed atmosphere with opportunities for many outdoor activities, from horseback riding to a 21-element high and low ropes/challenge course. San Marcos is home to Texas State University, allowing numerous opportunities for academic and cultural exchange. San Marcos Academy is located only an hour away from beautiful Austin, Texas, so travel by air is easy for both national and international students. The campus is centrally located, just three hours from Houston and four hours from the Dallas/Fort Worth area. The principal purpose for the Fine Arts (Visual Arts, Drama, and Music) at SMA is to support the total learning mission of the Academy by fostering the intellectual, artistic and aesthetic development of all students through classes and arts experiences provided by performances and exhibits. The Academy music department is housed in a brand new suite in the Lee Hage Jamail Special Event Center. A band hall, choir room, and ten other areas for private practice or group rehearsals are available in this facility. Students who are drawn to the stage can study theatre arts at the Academy, and the visual art program includes instruction in all types of media, including ceramics, digital photography and video production. In today's world, now perhaps more than ever, an institution like SMA is called to uphold its tradition of changing lives and building leaders. Although times have changed, we continue to build leaders as we always have . . . by providing a rigorous education in a Christian environment that not only imparts knowledge but also builds character and instills personal moral values. 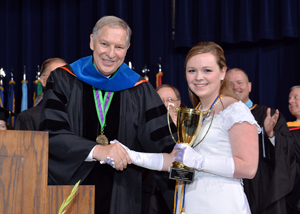 The challenges of a complicated world give San Marcos Academy an opportunity to reaffirm our mission. If you are looking for a private boarding school that can provide your son or daughter with a nurturing environment in a beautiful location with a caring and dedicated staff, then look no further than San Marcos Academy. We look forward to hearing from you and developing a relationship that will last for a lifetime with your son or daughter.